The plush inner sleeve and the soft cushioning are the main reasons for the Lunarglide 8’s comfortable ride, based on most reviews. It runs very light for a stability shoe, according to several comments. A good number of runners have used the 8th iteration of the Lunarglide as an up-tempo or high-mileage trainer. The breathability of the shoe was appreciated by a few. A small number of reviewers noticed that it performed as well or better than some of the most popular lightweight stability shoes around. More than a few runners noted that this shoe was reasonably-priced. More than 10 different color combinations for runners to choose from. Most runners were frustrated by the pebbles that gather in the outsole of the latest Lunarglide. Some runners felt that the shoe lacked the responsiveness of the previous model. It is quite tight and narrow, unlike the earlier version of the Lunarglide, remarked several. The outsole is blamed by most negative comments as the main difference in the ride and performance between the 8th version of the LunarGlide 8 and the earlier model. Outsole durability gets a heavy dose of criticism coming from a significant number of runners. The Nike Lunarglide 8 is a lightweight, well-cushioned, and supportive trainer that can basically take on any type of distance. With great comfort, breathability, and solid versatility, runners should have a really good shoe for their trainings. What makes the shoe a winner is its ability to compete with some of the more illustrious lightweight stability shoes around without having the same hefty price tag. “These shoes are ugly" - they are the first words my wife said to me when I put them on. True, they are “odd,” and the color may not be the most pleasing, but I always love to try different things. Let me just say, I'm glad I did. I didn’t even know these things existed before I saw them on sale on a website for dirt cheap, at the time. I was familiar with the Lunarglide line and even familiar with the Lunarglide 8, but I never saw this special edition. For the price and the great reviews the regular model 8's had, I bought them right away! 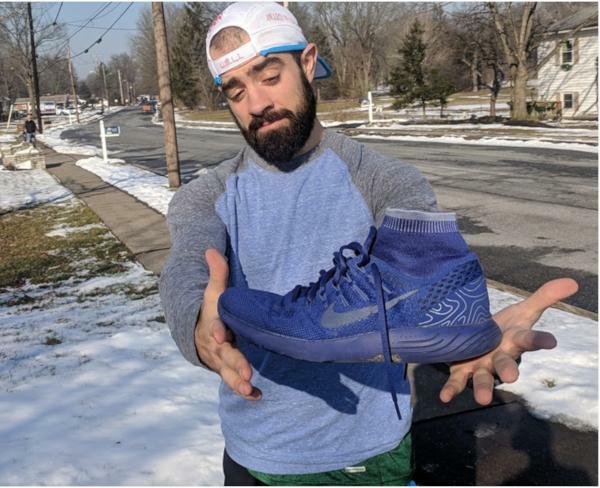 I was looking for a solid training shoe with some support that I could throw in the mix during training for my 2nd marathon. After about 250-mile run on these bad boys during training, these are my thoughts. I love the feel! As soon as I put these things on, I felt connected. I am a huge fan of the snug fit and the upper collar on the shoe. It just brings a feeling of connecting with your body. As you walk around in these, you get to feel something really special. It has a great mix of support and mobility. I am a mild overpronator, and these things provided me just enough support to help me stay neutral without holding my movement back. This is the absolute best shoe I felt upon initial feel. It required no break-in. As you begin to walk in these shoes, you feel the softness. They are very comfortable and bring your run to feeling stress-free. I absolutely enjoyed the combination of comfort and support. Was perfect for my long training runs. I am a believer that if you don't like the way the shoes feel when walking around, then you won't like them when you’re running. The Nike Lunarglide 8 B Side is comfortable across the board. After running 250+ miles in these one final thing comes to my mind when it comes to "feel." They are consistent. Doesn’t matter what type of run or how you feel that day, these shoes brought on the same feeling each run. I was definitely impressed by the overall feel of this shoe. Just for a frame of reference; what I was expecting for performance was a solid training shoe that I could break out in long, short and recovery runs at a variety of paces. I was hoping that they would perform and PERFORM, they did. The Nike Lunarglide 8 were my go-to shoe for long training runs. I think that is where the shoes shine! With these on my feet, a 10-20 mile run felt like gold. They gave me a consistent feel of stability and the lightweight of the shoe made me feel very fluid. I loved these shoes for my recovery slow paced runs as well. The soft midsole brought me to having sustained comfort even when I was a bit sore. I didn’t do much speed work with these, but my takeaway was these shoes were not built for speed. The comfort and soft feel just didn’t give me a lot of energy return nor provide a “speedy” feeling. I believe you can use these for multiple purposes, but the absolute sweet spot is the long, moderate paced training run. Now for the fun part. Time to BREAK IT DOWN!!! This part of the shoe was an unexpected surprise. I never ran in a shoe with a collar which in return lead this shoe to be a mid-top running shoe. Wow, I loved it! It was not odd to feel at all. It brings on a solid sense of connection and brings the fit to feel very snug. The toe box is great! It is nice and roomy in there, allowing the toes to splay naturally during your gait cycle. The tongue and lacing system is a little weird, well because…. it has no tongue. The lack of tongue leads the laces to not being able to tighten the best. In my opinion, it didn't allow me to lock down my foot as much as in other shoes. On the other hand, these heel cups are really cool. I love the design, and they brought on a great fit too. The midsole is one of the most comfortable I’ve felt. Brings on a great cushion. The arch support it has is slight but effective. It brings on all that I need and will work for anyone who is a mild overpronator. Now, this is the biggest flaw in the shoe. Nike has recently started removing the rubber treads on some of its models which brings on better feel and reduces weight, but it comes with one big sacrifice - WEAR. As you can tell I am a heel striker and these things just didn’t hold up as I would like. After about 200 miles, they were worn, and after 250 they were done! The traction, however, is solid and I never slipped or lost footing surprising enough. It doesn’t seem like they would be effective, but they are. The tread does lead to some small stones getting in there, but it doesn’t affect the run. You will have to scrape them out before each run which will take about 10 sec. Overall this is a solid daily training shoe which excels in its ability to provide comfort - support - mobility, at the same time. This shoe is my go-to for long mileage training runs. If you are training for a long race, throw these things in the mix. You won’t regret it! I like the look of the shoe, the weight of the shoe is great. All in all, it is a comfortable shoe, but don't really like the aesthetics. The LunarGlide 8 has all the right boxes checked off. It fits well, it has ample cushioning, superb traction, lightweight, and Nike’s style. The price of the shoe seems really reasonable too. Nike ushered in several changes in the 8th incarnation of the Lunarglide to enhance its already top-notch performance. The upper sees most of the changes in this shoe. From the Flyknit-like material of the earlier version, the new one is made of slightly thicker engineered mesh for better durability and support. The Flywire cords used in the second version are significantly bigger for added durability and better midfoot hold and support. Nike removed the heavy and stiff heel counter in the prior version. In the latest model, a heel stiffener is fully integrated for a more sophisticated look and with adequate heel security. The outsole gets a serious makeover as well. From the almost flat and circular pattern of the past model, the new Lunarglide has siped outsole pattern that flexes upon impact. The new design helps with the cushioning and flexibility of the shoe. The fit of the Lunarglide 8 continues to be a haven for those with narrow to medium foot measurements. It offers a snug fit in the heel, the midfoot, and just enough real estate in the toe box for the toes to be comfortable. Minus the heel counter, the heel still has a wraparound feel that is not too stiff. The drawstrings in the midsole deliver excellent midfoot hold and security. Sizing is accurate in the shoe. The laser-cut outsole provides added cushioning as it slightly compresses upon impact. It is made of rubber that it is softer than before for that really soft and well-cushioned ride. The outsole also helps with the shoe flexibility because of the prominent laser cuts. This outsole configuration is also used in the LunarGlide 9 running shoe. The Lunarglide 8’s midsole is the latest in the Nike’s fold as it uses lasers to carve the midsole with specific cuts to give the right amount of leeway in the foam for better cushioning and responsiveness. Nike’s Dynamic Support system is at work in the midsole as well. A stiff wedge of foam is used in the heel to the midfoot to work with the softer Lunarlon foam on the lateral side. Hence, there is support needed by mild to moderate overpronators without the added weight of a stiff TPU insert. Also, neutral runners can also get the most out of the shoe as the support and stability are “on-call” or needed only when the neutral runner’s form breaks down. The upper of the Nike Lunarglide 8 is a near one-piece construction made of engineered mesh with excellent breathability and support. For better midfoot hold and durability, Nike replaced the very thin Flywire cords with substantially thicker versions of the drawstrings. To prevent the thick cables from causing pressure on top of the foot, a plush inner sleeve is added in the mix. Both the tongue and collar have decent cushioning and very luxurious. A traditional lace-up closure ties up the runner’s most comfortable fit.